Blue Fountain | Just Shooting Memories! 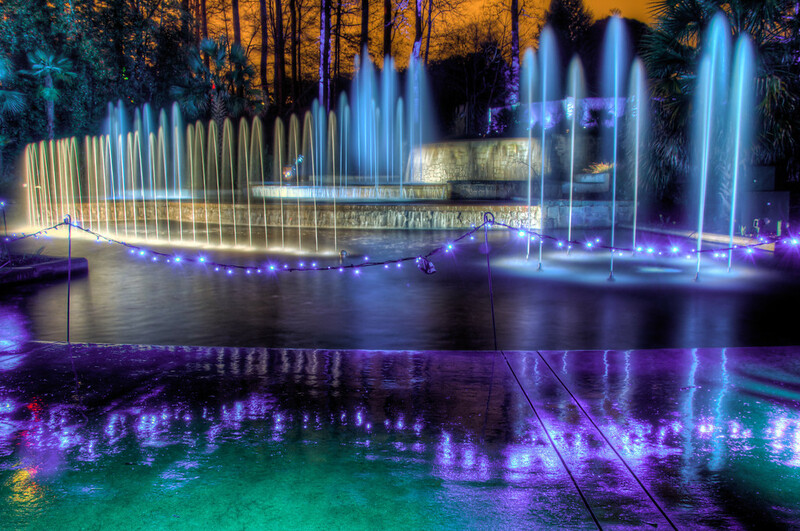 Another shot from the Garden Lights exhibit at the Atlanta Botanical Gardens. We were fortunate that, until just before this shot, there was almost no rain. The rain made the last 30 minutes or so a little uncomfortable, but it was not unbearable. It is interesting to see peoples reactions when they run across someone taking a photo. Their first reaction is to stop and remain out of the line of the camera so that they will not be in the photo. It took a little encouragement to get them to walk in front of the camera. During this shot, there were at least 5 – 10 people that walked across. I guess they thought I did not have the camera on.